Democratic primary voters say they are looking for a nominee who can go "toe-to-toe" with the president. STORM LAKE, Iowa — Presidential candidate Elizabeth Warren has built a fan base among progressives in the Democratic Party but is facing concerns from some voters here about whether she can go "toe-to-toe" with President Donald Trump in a general election. Warren has built her candidacy on a record of being a long-time champion of the middle class and speaking out against what she says is an economy stacked in favor of the rich. At a progressive forum in Washington, D.C. recently, she received some of the most boisterous applause of any of the presidential candidates. 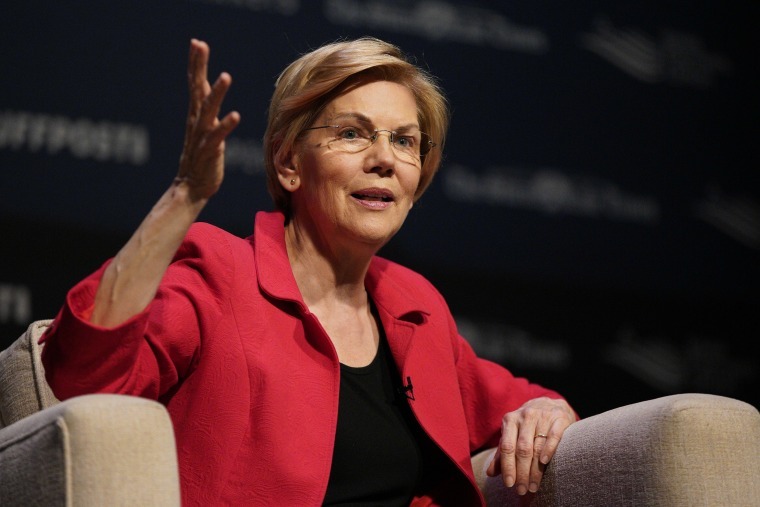 But the issue of Warren's ability to beat the president emerged several times at Warren events on a recent campaign trip to Iowa as voters are working to determine which of the more than one dozen Democrats vying for the nomination could best tackle Trump. Polls show that electability is a top concern of Democratic voters in selecting a 2020 nominee, a change from previous years when voters said having the right issues or personality were more important. And that's a question Warren seems to get more than other presidential candidates at this phase in the campaign, starting from her very first swing as a candidate back in January. New Jersey Senator Cory Booker wasn’t asked about electability once on the stump one recent weekend in South Carolina and Texan Beto O’Rourke is rarely asked the question in the three weeks since he announced his candidacy. Warren was asked about it twice in two events last weekend and voters repeatedly brought it up as an issue that concerns them. It’s an issue that her campaign acknowledges they must address. “One of the things we keep hearing out on the road goes something like this: ‘Elizabeth Warren would make the best president, but can she really win?’” her campaign manager Roger Lau wrote in a Medium post last week. Privately, some Warren allies complain that voters are thinking more like pundits than voters, by trying to select a nominee who they think might appeal to a hypothetical swing voters than to themselves. Warren, who has been preparing her for her candidacy for two years, already has been the subject of Trump's attentions. The president has frequently jabbed her at his campaign-style rallies, derisively calling her "Pocahontas" as a way to highlight controversy surrounding her past claims of Native American heritage. Warren has tailored a response, pointing to her work in passing difficult legislation and her election victory over Massachusetts Republican incumbent senator Scott Brown. “I know how to fight and I know how to win. I’ve done it. I’ve done it in an election and I’ve done it to get a law passed. I don’t give up. I never have and I never will,” Warren told reporters in Iowa. Warren has positioned herself as one of the most substantive candidates at this point, unveiling a dozen policy proposals. She is prioritizing a grassroots campaign and meeting voters, especially in early states of Iowa and New Hampshire. She has already held 46 “meet and greet” events in Iowa since the beginning of the year and hired 80 state-based staff in early states. She’s shunned the high-dollar fundraising circuit and instead spending her time talking to voters. Karine Jean-Pierre, chief public affairs officer for MoveOn, said the progressive group's members are most concerned with the positions a candidate supports. "She has been a leader, at least in this cycle, with the bold issues she’s put forth, and there’s a lot of depth," Jean-Pierre said. "They’re substantive, they’re progressive and I think she needs to continue to do that." Many voters at her events say they like what they hear and love her policies, which mostly reflect the progressive wing of the party, but concerns persist about her ability to beat the president. “I think it’s going to be a whole different fight than the whole way she’s fighting. She’s a very smart woman, a very personable woman. Nine out of ten times she would do well but this isn’t going to be a battle for policies because Trump doesn’t have any. This is going to be a personality war and I think the nomination will be light on policies,” said Franck. Gender is also playing a role in voters’ perception of her electability. “She’s a woman number one. I think she appears weak even though she’s not,” said Jacob Kvinlaug of Marshalltown, a retired homebuilder. A recent Monmouth University poll found that 56 percent of Democrats and Democratic-leaning independents said that they’d rather support a candidate that could beat the president even if they don’t agree with the candidates’ positions. And an NBC poll found that 40 percent of likely primary Democratic voters said that “electability” was a major concern to them. For her part, Warren is seeking to answer those concerns one voter at a time. “I’m out here talking to people. I take questions. I got my 210th questions today. I take questions from everybody. I meet people. I shake hands and I talk about the issues that matter to them,” Warren said last weekend. Alex Seitz-Wald, Garrett Haake, Vaughn Hillyard and Ali Vitali contributed.